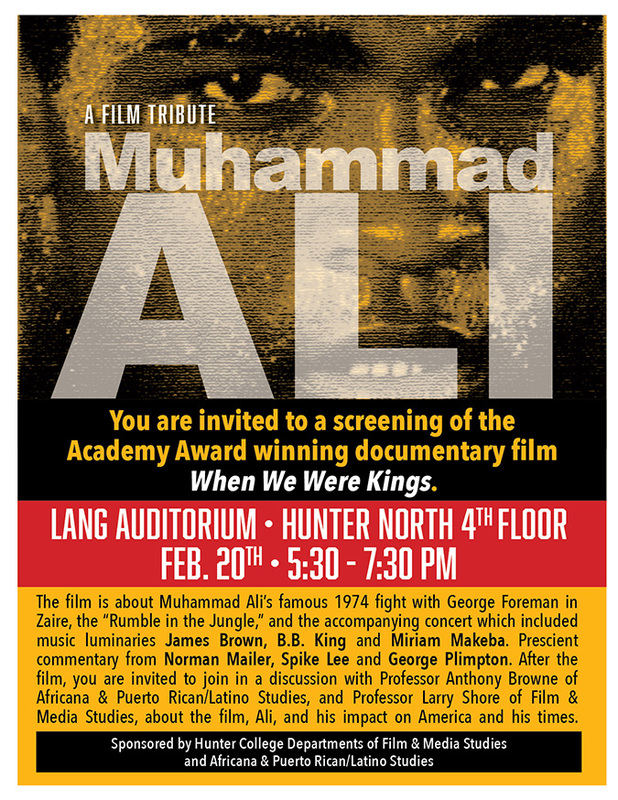 Join us for a screening of the Academy Award winning documentary film When We were Kings. The film is about Muhammad Ali’s famous 1974 fight with George Foreman in Zaire, the “Rumble in the Jungle,” and the accompanying concert which included music luminaries James Brown, B.B. King and Miriam Makeba. Prescient commentary from Norman Mailer, Spike Lee and George Plimpton. After the film, you are invited to join in a discussion with Prof. Anthony Browne of Africana & Puerto Rican/Latino Studies, and Prof. Larry Shore of Film & Media Studies, about the film, Ali, and his impact on America and his times.